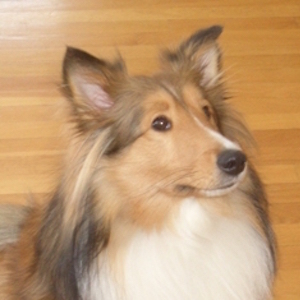 “Murray (born in 2008) is the most laid back Sheltie I have known,” says his partner Ardie. She adds that nothing seems to bother him – including his very active best friend, Mia. His patience is endless with adults and children as well as other dogs. Ardie & Murray visit as a North Star Therapy Animals team at both Park Nicollet Methodist Hospital and Children’s Hospitals and Clinics of Minnesota. The team also works with specific patients working on rehabilitation through the Children’s clinic in Minnetonka. On one occasion the team was contacted by Children’s Hospital on a Saturday for an unscheduled visit to help a little girl who had had surgery the Wednesday before. Although doctors, nurses, and parents had tried everything they could, they were unable to get the child to sleep. The little girl loved dogs which prompted this special request. Ardie & Murray answered the call, arriving around 3:00 that afternoon. Ardie placed Murray in the bed next to the little girl and the rest, she says, was left to them. The little girl cuddled next to Murray and petted him for quite some time. You know what happened next, right? Murray fell asleep!! The little girl then asked her father for her blanket and everyone thought that would be it. She didn’t want the blanket for herself, but covered Murray instead. Minutes later, she fell sound asleep next to Murray. Ardie calls these stories mini-miracles, and says they happen often. Away from visits, though, Murray loves to play and run with the family’s other Sheltie, Mia. He enjoys games of Frisbee and playing with the children in the neighborhood. Ardie says his most favorite activity is probably a visit to Dairy Queen for a “pup cup”.